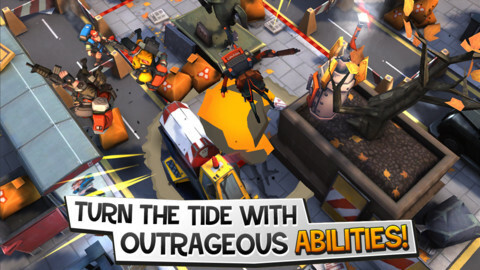 The long-awaited turn-based strategy title finally hits the App Store. 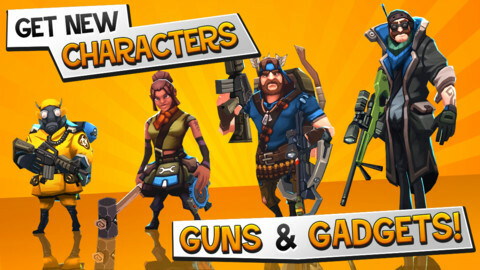 Check out our RAD Soldiers cheats and tips guide. After gorging ourselves silly over the festive season on one of the finest games of 2012, the outstanding modernized edition of X-COM: Enemy Unknown, we're nothing less than delighted to return to work on a blustery winter morning to get stuck into Warchest's RAD Soldiers. 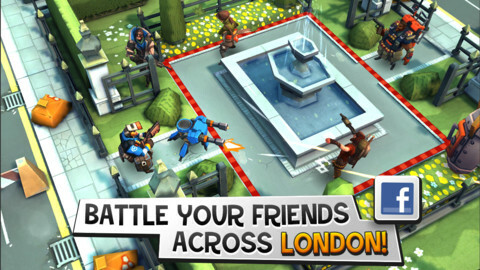 While it may be a comparatively simple turn-based strategy game, it's an exceptionally well executed one. Touchscreen controls are top-notch, with pinch-zoom and rotational gestures intuitively implemented, allowing you to get a peek at enemy positions behind damage-stopping cover and stay on top of the unfolding strategy. Each unit type in the game adds a different flavor to the tactical combat, although you can only add so many to your fighting squad before a match begins, and each one is restricted in its movement and firing options by a fixed energy currency that's topped back up after a turn. Use up too much energy getting into position, and you might not be able to take a shot at that juicily positioned enemy. Take a shot in open space however, and you might not have the means to reposition your unit towards safety before the turn ends. Units are varied in their specialties and performance on the battlefield, so some might excel at flinging grenades around from range, while others prefer to get up close and personal. It's a pretty forgiving strategy title too, and errant shots and poor positioning can always be remedied by undoing your previous actions to receive your energy back. Depending on your familiarity with turn-based combat gaming, that's either a boon or a bust. As this is a free game, enhancement and progression is made via coins that you can earn either through success on the battlefield or from buying in the cash store. These upgrades range from meatier weapons to mere cosmetic changes, and if you're not averse to a little light grinding, then you should be able to put together a decent, free fighting force to handle all occasions. For the most part, you'll be earning those coins in the single player Challenge mode. Here you'll face off against a series of increasingly tricky (and numerous) fighting forces across a series of maps, while defending an object by staying within its range for a certain number of turns. Stay alive long enough and you'll eventually win the battle, or alternatively you can just destroy the enemy units entirely to force an outright victory. There's a good mix of difficulties too, and if you hit a wall you can always replay earlier challenges for an arms boost. 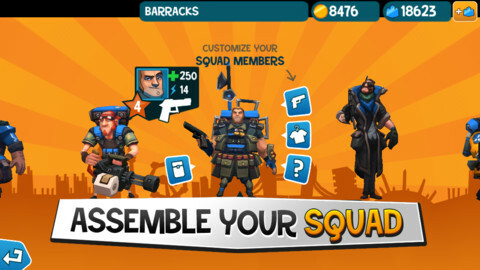 Once you've exhausted the game's single-player challenges (and there are plenty to chew through), the real warriors will want to take the game online and face off against a real human squad. This is where the most committed are likely to be rewarded the most handsomely, as the more currency you have, the greater the fight you can put up. Mercifully, you can also have more than one game running concurrently, so if someone's being a slow-coach you can still keep playing. RAD Soldiers is a very well executed touchscreen game, and will do a good job of scratching that turn-based itch while you're away from the meatier console and PC games in the genre. That said, we did find the objectives and locations just a little bit too repetitive, and beyond the admittedly pretty artwork there's little personality to be found in your squad's grunts and groans as they maneuver their way around the battlefield. Still, there's no reason for not taking this free game out for a turn or two. What's Hot: Crisp visuals, well-executed touchscreen controls, and a decent variety of unit types. What's Not: The core strategy can become a little repetitive, and you'll need to do some grinding to get the most out of the free game.